How to write the perfect press release for an announcement of a new technology? Download this free official press release template! 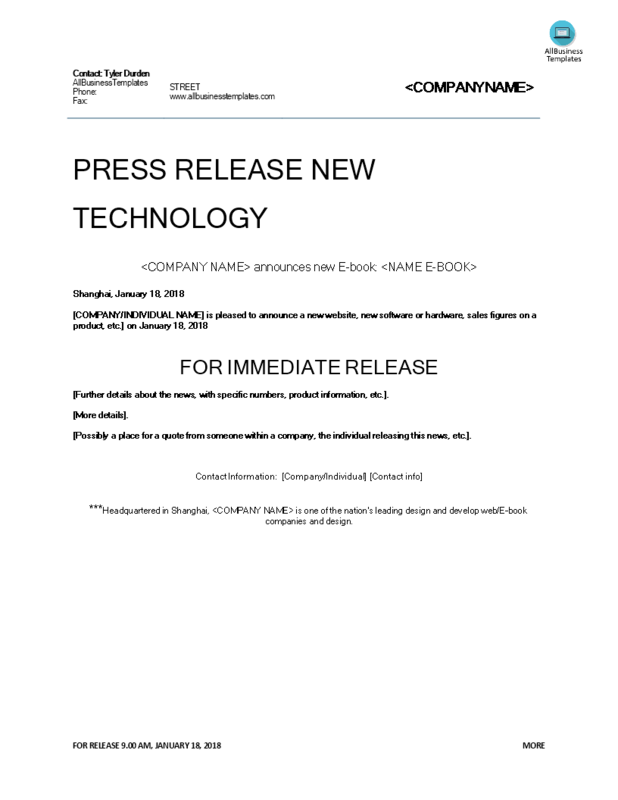 This Tech Press Release for an announcement of a Technological development template is specifically used to spread the news regarding something your company has produced or designed. For example: new software, new hardware, new website, etc. An official tech press release means that you make a public statement regarding a technological development that you have achieved and that is specifically prepared and distributed to the press by a public relations firm, governmental agency, etc. This Tech Press Release, or any other Press Release, on our website, are valuable templates if your company wants to make a public announcement. Please browse our website if you are looking for a certain type of press releases. Our free press release templates are used by PR professionals. Download this Press release template if you want to announce a new technology and save yourself the time, costs or effort! After downloading and filling in the blanks, you can submit your press release via press release distribution companies, press release distribution sites or local press. Examples include Business Newswire, Dowjones Newswire, Marketwire or PRNewswire.